Custom photo magnets are great for holiday pictures, personalized calendars, save the dates and much more! All orders include Free Standard Shipping! Eco-friendly 16mm magnets made from recycled materials for durability. Come in small or large, portrait or landscape. Make a statement with your customized poster printed on high-quality photo realistic paper. Choose your size and quantity for pricing. Make a huge impression for a low cost! BuildASign is your best online source for personalized fridge magnets. 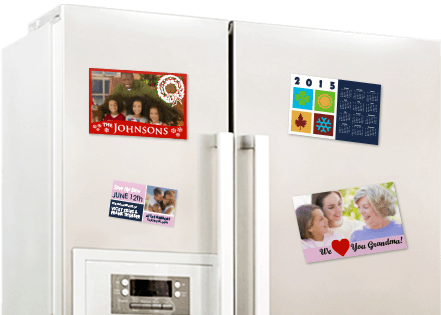 Use our world class design tool to create your custom refrigerator magnet that can be used to promote your business, group, life event, or photos. Let all your guests know to pencil in their calendars with a save the date magnet. Invite your friends to a birthday party with a custom magnet. Promote your business with a photo fridge magnet to hand out at corporate events and to loyal customers. We offer the two industry standard sizes of business card magnets and postcard magnets. Both come on high-grade magnetic material durable and clean enough to ensure a high-quality magnet that your friends and customers will love to showcase in their home.All magnets come ready to be distributed and hung by your recipients! Order your custom photo fridge magnets today!